Looking for the first step in working with scuba as a career? 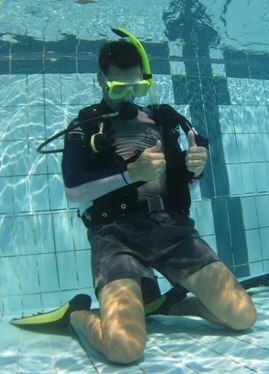 PADI Divemaster is the first professional level in scuba diving training. Under the direction of PADI Course Director Jerry Reichart you will expand your dive knowledge and hone your skills to the professional level. PADI Divemaster training develops your leadership abilities, qualifying you to supervise dive activities and assist instructors with student divers. In order to start your PADI Divemaster course you need to be a PADI Rescue Diver, or equivalent, be 18 yrs. old and have 20 logged dives. As part of your training you will be assisting with actual student divers in both confined water and open water settings, supervise certified divers, and learn how to conduct certain programs such as Discover Local Diving, Scuba Review,etc. Your diving skills be polished to perfection and your general diving knowledge will be expanded to a very high level. In addition you'll learn organizational tasks to ensure all boats are ready and your divers feel well taken care of. While the PADI Divemaster course can be completed in 8-10 days we offer a relaxed 24-days internship with an option to stay on.